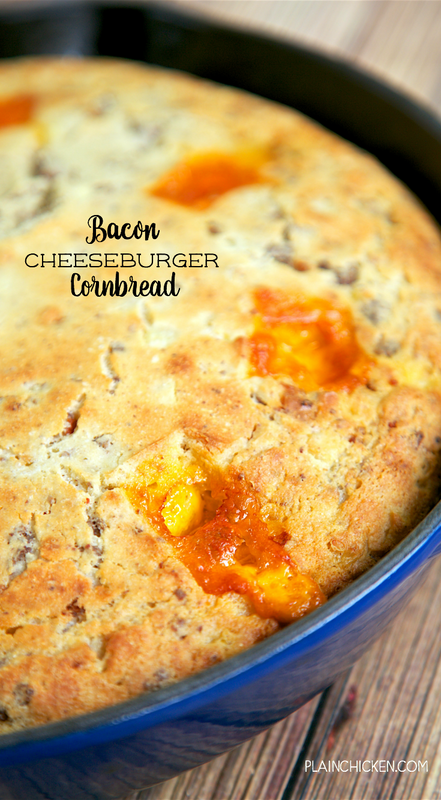 Bacon Cheeseburger Cornbread - comfort food at its best! 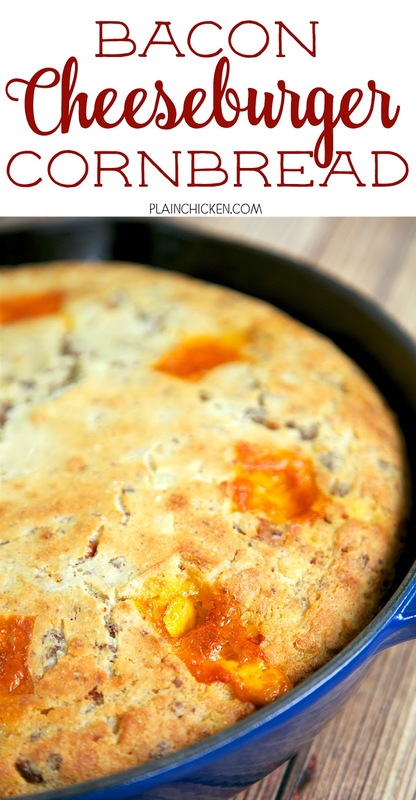 Homemade Southern buttermilk cornbread loaded with hamburger meat, bacon and cheddar cheese. The chunks of ooey gooey melted cheese are the star of this dish! 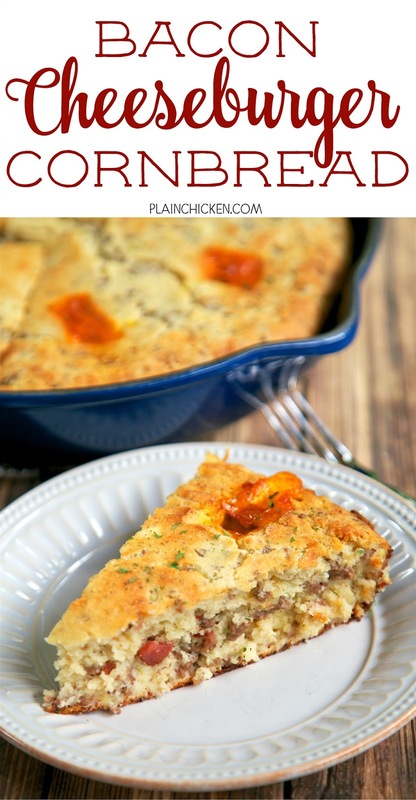 Serve with a salad for a quick and easy weeknight meal!! Also makes a great dish for a potluck. 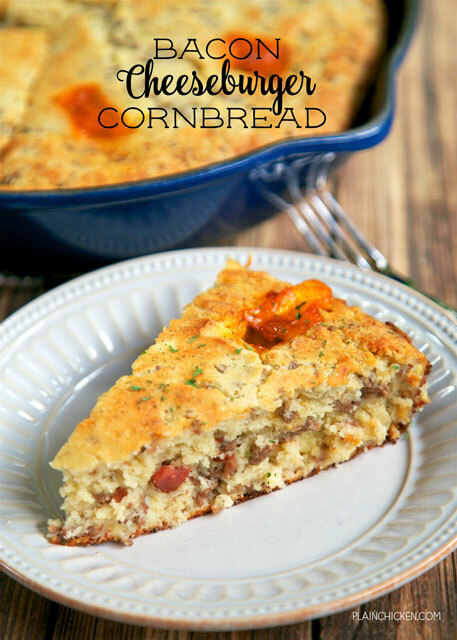 This Bacon Cheeseburger Cornbread is total comfort food. My favorite part of this dish were the big chunks of melty cheese. SO good!!! This recipe was inspired by something my Mom recently ate at a party. She was telling me about it the last time I saw here, and I knew I had to recreate it at home. 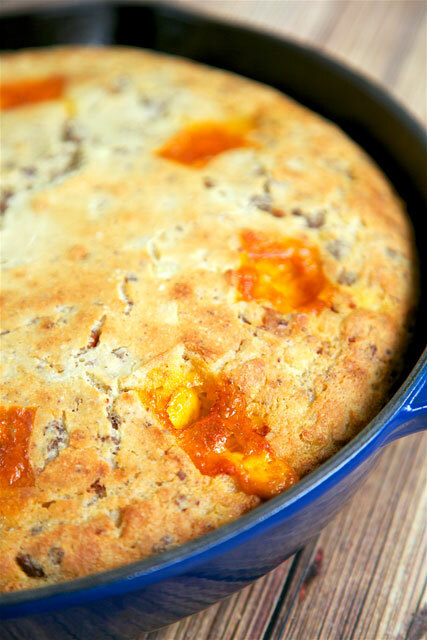 This is my standard cornbread recipe loaded with hamburger, bacon and chunks of cheddar cheese. The dish my Mom ate didn't have bacon. I decided to add some bacon, because bacon! OMG! This was a huge hit in our house. We ate this with a quick side salad for an easy weeknight meal. I used White Lily Self-Rising Buttermilk White Cornmeal mix. It is my go-to cornmeal mix for cornbread. If you can't find White Lily where you live, you could use Aunt Jemima Buttermilk Cornmeal Mix or Martha White Self-Rising Cornmeal Mix. Pour oil into a 12-inch iron skillet. Place skillet into cold oven and preheat to 425ºF. In a large bowl, combine cornbread mix and flour. Whisk in eggs and buttermilk. Stir in bacon pieces and cooked ground beef. Set aside. Cut cheese block into 8 (1-oz) pieces. Set aside. Once oven has preheated, carefully remove skillet from the oven. Pour cornbread batter into hot skillet. Quickly place cheese chunks around edge of skillet. Return skillet to the oven and bake for 35 to 40 minutes, until golden brown. Cool slightly and cut into 8 slices.